Because we live in an age of reboots and remakes, adult audiences are perpetually being reacquainted with their childhood as Hollywood re-entertains us with the stuff we loved when were kids. Lately pop culture seems infected with what could be called Ruined Childhood Syndrome, in which a collection of unreasonable grownups get offended at movie studios for desecrating their cozy adolescent memories by updating a piece of mainstream entertainment. The latest outbreak occurred thanks to today’s release of Ghostbusters. It draws to a close a two-year hissy fit from online commentators who made it their mission to tear down this female-driven redo of the 1980s classic. They went so far as to make the initial trailer the most unpopular ever on YouTube and, more recently, to flood IMDb’s Ghostbusters page with low user scores, even though audiences haven’t had a chance to see the movie yet. Listen, everyone hates it when a sequel like Indiana Jones and the Kingdom of the Crystal Skull is atrocious, but the sight-unseen fury of people like Crazylegsmurphy is an entirely emotional, subjective and empty argument. Forgetting for a moment that this new Ghostbusters is actually good, his chief criticism seems to be that the people who made it didn’t check with him first about why he personally liked it so much. This is the whole ethos behind Ruined Childhood Syndrome. And it gets growing up exactly wrong. We shouldn’t be trying to protect our younger years like they’re a precious, flawless Fabergé egg; we should be willing to smash those memories into little pieces. In other words, one of the best things you can do is ruin your childhood. A few years ago, I wrote a piece against nostalgia, arguing that “we’ve got to stop indulging our obsession with our past.” And while I still feel that way, I’ve recently been forced to revisit my own pop-culture past thanks to a weekly podcast in which my partner Will Leitch and I take requests from listeners, who can suggest any older movie they’d like us to review. That’s meant re-watching a lot of 1990s films — it’s telling that many of them came out during the formative years of most of our listeners — and what’s happened is that movies I used to think were great didn’t hold up. Why had I not liked these movies as much as I once did? Well, because I’m older now — I’ve seen a lot more movies, and I’ve lived more of a life. Experience tempers the unbridled passion of our youth, which became obvious to me once I tried to recreate the mental picture of what it was like to watch those films the first time. I noticed I had fond memories attached to the movie that had nothing to do with the movie itself. For instance, I was in film school for Menace II Society, excited to be around a group of fellow movie-lovers for the first time in my young life. With Face/Off, I was early into my adult life, getting my first taste of seeing movies at press screenings. I could still remember the thrill of being one of the first people to see that film — and to be dipping my toe into the waters of becoming a film critic. With both movies, the emotions attached to the viewings were as palpable as my impression of the actual movies themselves. So while I sympathize with Crazylegsmurphy, romanticizing the past means being scared of the present and the future — and to approach every new thing from a defensive crouch. It’s a deeply selfish point-of-view. My 12-year-old nephew’s relationship to Star Wars is far different from mine, but why would I want to deprive him of his love of something I also loved (in a totally different way and in a totally different context)? 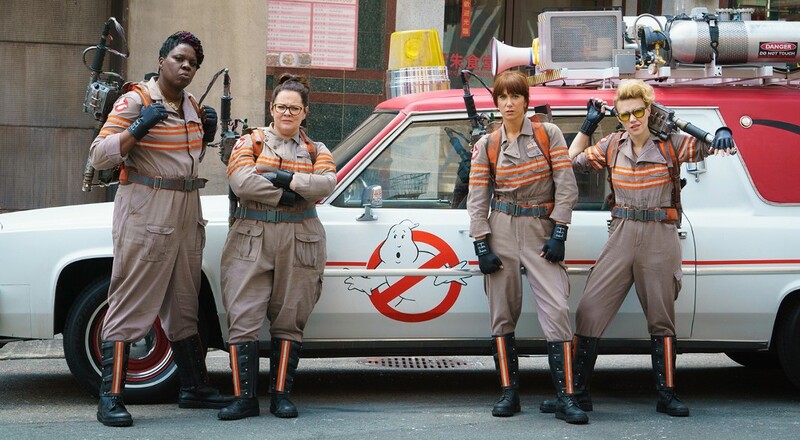 That point couldn’t have been made any clearer than by a tweet that went viral Sunday, showing Ghostbusters co-star Kristen Wiig hanging out with some little girls dressed up in character for the film’s premiere. That right there is why it’s worth ruining — or, at the very least, demystifying — your childhood. You should never feel so possessive of your entertainment that you feel like you can’t share it or give it an honest reassessment as an adult. The first Ghostbusters was far from perfect. Acknowledging that doesn’t mean you’re betraying your memories; you’re simply recognizing that you’re not at the same place in your life now. And as that tweet shows, the tighter you cling to your childhood loves, the less you’re allowing actual children to enjoy their childhood. With any luck, down the road they’ll have the opportunity to ruin theirs, too.